During childbirth, especially if it is vaginal childbirth. In some cases, your doctor may suggest doing a Cesarean section to lower the risk during childbirth. You can greatly lower that risk by taking HIV/AIDS medicines. These medicines will also help protect your health. Since some medicines are not safe for babies, it is important to talk with your health care provider about which ones you should take. Then you need to make sure you take your medicines regularly. Your baby will get HIV/AIDS medicines for 4 to 6 weeks after birth. The medicines protect your baby from infection from any HIV that passed from you during childbirth. Your baby will get several tests to check for HIV over the first few months. 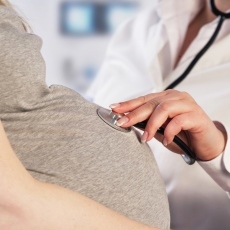 Some pregnant women with HIV/AIDS may not know that they have it. So it is important that all women who are pregnant or planning to get pregnant have an HIV test as early as possible. Because most pregnant women with HIV/AIDS and their babies take HIV/AIDS medicines, few babies in the United States get HIV.